Reports of more recent peals and quarters, in 2014, are here. Four district ringers crossed the border into the Hunts District and rang a quarter on the heavy 4 at Elsworth for the Carol Service. At approx 16 cwt, Elsworth are the 2nd heaviest ringable 4 in the world. Quarter peals were rung in memory of Nelson Mandela at Histon on Sunday 8th Dec, Willingham on Monday Dec 9th and Over on 12th Dec, and a 720 was rung at Isleham in memory of the former vicar, Revd David Kightley. Another first for Sean Langton: First minor as conductor. More peals were rung by the Royal Cumberland Youths in memory of Rosemary Palmer, on 10th Nov at Spitalfields, London, and on 17th Nov at Keele, Staffordshire, and at Terling, Essex. On Sunday 10th and Monday 11th Nov, quarters for Remembrance were rung in the district at Histon, Over, Swaffham Bulbeck and Willingham. On Saturday 9th November, a quarter peal was rung at Cottenham to celebrate the 50th anniversary of the opening of Cottenham Village College. The band was made up of past and present parents, governors, a student and staff at the college. On Sunday 20th October, a quarter peal of St Simon's Triples was rung at Histon. This was the first in method for all the band. On Saturday 12th October, a peal was rung in memory of Rosemary Palmer at Stretham by the Society of Royal Cumberland Youths; five of the ringers were also Ely District members, including Colin Johnson who was taken ill that night. The Society of Royal Cumberland Youths rang another peal in memory of Rosemary at OLEM on Wednesday 16th October. A quarter of DNCBM was rung at Over as a 45th wedding anniversary compliment to Marion and Doug Robinson on Tuesday 8th Oct.
A quarter peal at Histon was rung on Sunday 29th Sept as a birthday compliment to Geoff Grayton and was the first of major inside for Simon Durrant. Geoff Grayton rang his first quarter of Netherseale at Over on Thursday 3rd Oct.
A peal was rung at Over for the EDA on Sept 21st by a largely Suffolk Guild band to mark George Thoday's 60 years of ringing. George learnt to ring at Over. Quarter peals were rung at Histon, Southwold and Orwell on Sunday 1st Sept in memory of Rosemary Palmer who died on Aug 31st. Also at Ixworth on Monday Sept 2nd, OLEM on Wednesday 4th Sept, St Neots and Earl Stonham on Friday 6th Sept and Godmanchester on Saturday 7th. And two peals: one by the Suffolk Guild and one at Thriplow. And at Old Stoke and Danbury (Essex) and another quarter by the Suffolk Guild at Bury St Edmunds. And an Ely DA handbell peal at Mawson Road, Cambridge..
A quarter peal of Ipswich S Minor was rung at Over on Thursday 22nd August to wish Geoff Grayton a speedy recovery following his recent fight with a lawn mower. A fine achievement at Soham on Thursday 15th Aug with 2 District ringers achieving a 'first'. Well done to Geoff Grayton (first Caters inside) and Andrew White (first on ten). Also well done to Barbara Le Gallez on ringing a quarter of 'Horton's Four' - London Bristol, Belfast and Glasgow) at Meldreth on Saturday !0th Aug. It was nice to welcome back two former Ely District ringers to the Diocese: Alan Barber and George Thoday rang in a peal for the EDA at Great St Mary on Saturday Aug 3rd. Another peal was rung in the District at Swaffham Bulbeck to celebrate the wedding of a colleague of Dee Smith. Congratulations to Ruth Bramley on her first quarter peal - Saturday 3rd August at Oakington. More Prince George Quarters: at Burwell and Chatteris. Also at Histon and Willingham. The first quarter peal in the district to mark the Royal Birth was rung at Swaffham Bulbeck on Thursday July 25th, and another was rung at Oakington on Friday July 26th. A quarter was rung at Over on July 11th to congratulate Helen Barker on gaining her degree. Congratulations to Edie Robinson on ringing her first peal of Maximus inside on the difficult and challenging bells at St Giles, Cripplegate, City of London on Sunday 23rd June. A largely District band rang a peal of Cassiobury S Major for Burwell Carnival on Saturday 22nd June, which was the first in method for Dee and Phil. An almost-Ely District band rang a peal at Chatteris on Sunday 2nd June to commemorate the 60th anniversary of the Coronation. A peal was rung at Wilburton on 29th May in thanksgiving for the life of Gill Bland, a former ringer at this tower who died earlier this year. Five of the band used to ring with Gill and her husband Ian before they retired to Lincolnshire. It was also the first peal since the construction of the new ringing gallery. A quarter peal was rung at Over on May 2nd to mark the departure of the vicar. Another almost entirely Ely District peal; at Histon on Saturday 27th April, to thank Helen Atkins for her work as Tower captain there. Six District ringers rang in a peal of Guernsey S Major at Fen Ditton on April 24th, and this was the first peal as Conductor for Barbara Le Gallez; an excellent achievement. Two quarters were rung in the district on St George's day, at Over and at Fordham, which also celebrated Ray Clist's 70 years as a ringer and was Alison Langford's first on 8. A peal was rung at Haddenham on Monday 22nd April to celebrate the birthday of Queen Elizabeth II. It was rung for the Society of Royal Cumberland Youths but contained five Ely District ringers. At the time, the date was believed to be the 80th anniversary of the first peal on the bells. Following research by Chris Pickford, it seems that the first peal was actually rung in 1820, on Wednesday 29th November for the acquittal of Queen Caroline! The photo shows the band: l to r in order of ringing, Colin Johnson, Marion Robinson, Sue Marsden, Edie Robinson, Peter Rogers, Phil Bailey (C). It was generally agreed that the bells go much better after the work done on them at the maintenance day. The last peal on the bells was Grandsire Doubles in 2001. April's Ely District 8 bell quarter was rung at Ely on Saturday 20th April and was rung in memory of Ruby Boyle, mother of Lesley Boyle from Swaffham Bulbeck. It was a first of Lincolnshire for Geoff Grayton. Another all Ely District peal, this time of Doubles, rung at Horningsea on the 50th anniversary of the first peal on the bells. Colin Johnson rang in both! Well done to Barbara Le Gallez on ringing in a silent and non-conducted quarter of Stedman Triples at OLEM on Wednesday April 2nd. Two Quarter peals were rung in the District on Easter Sunday: at Over and Histon. And on Easter Monday the Over ringers had a quarter peal day North of Peterborough, ringing quarters at Glinton, Stamford, West Deeping, Wittering, and Baston. Full report, with photos, is here. A couple of peals were rung in the District today, Saturday 16th March, with a number of District ringers in: at Longstanton (Jersey S Major) and Histon (Beer S Major). Several District Ringers rang a quarter of Cambridge Royal at Great St Mary on Sunday 10th March, conducted by Edie Robinson. Well done to Colin Johnson on ringing his 100th peal at Fulbourn on 2nd March. Colin rang his first peal there in 1978 and was the driving force behind the restoration of the bells in 1980. Since then 201 peals have been rung on the bells. The photo was taken in the pub afterwards, but the flash did not go off. 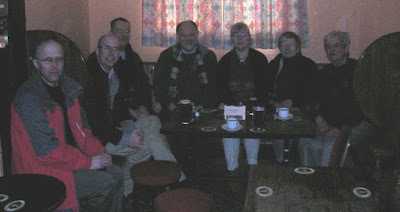 l-r: Peter Waterfield, Mike Purday, Ian Davies, Alan Winter, Sue Marsden, Jane Hough and Colin Johnson. Missing: Paul Seaman. Congratulations to Rachel Walls of Willingham who has rung her first quarter peal, at the first attempt, aged 15, on 2nd March. The quarter was rung to celebrate and give thanks for the 70th (Platinum) Wedding Anniversary of Rachel's Grandparents, Joyce and Harry Denby, married on 6th March 1943 in All Hallow's Church, Gedling, Nottingham. A 50/50 quarter peal at Chatteris tonight as we only had 6 at practice night: 3 from Chatteris and 3 from March who have been coming over as their church is closed while the heating is fixed. Their learners have made good progress and one of them rang his first quarter at the first attempt tonight: Well done James. A first quarter of Pudsey for Jon Reed at Bluntisham on Friday 22nd February with a mainly Ely District band. A good achievement at Soham on Thursday 21st February; 5 of the band rang Single Oxford Bob Triples for the first time. This was rung as a Thanksgiving for the life of Gillian Bland who with her husband Ian used to ring at Wilburton before moving to Lincolnshire. Well done to Edie Robinson on her first 12 bell peal on Feb 9th in Southampton, and to Janet Garnett on calling a peal at Hilton , the first peal for Valerie Ridgman from the Cambridge District. Congratulations to Roger J Smith of Burwell on ringing his first quarter peal at the first attempt on Sunday 10th February. Here is a photo of the band. A quarter peal was rung at Histon on Sunday 3rd Feb for the 70th birthday of Mavis Driver and for the St Andrew's Centre. Jenny Sommerton rang her first quarter peal on 3rd February, treble to Plain Bob Minor at Swavesey. 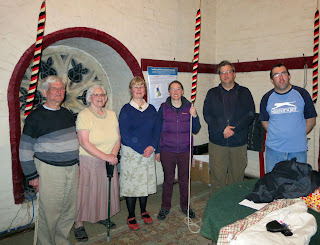 The ringers at Histon are ringing sponsored quarter peals to raise money for the St Andrew's Centre and on Sunday 27th January rang a quarter of Cambridge Surprise Minor for the birthday of Jan Payne. Two ringers from Histon rang a quarter at Great St Mary, Cambridge, for the Cambridge University Guild on Sunday 27th Jan.
25th Jan 2013. Quarter peal at Haddenham for the birth of Ruth and Robert Bramley's first grandchild. Ruth videoed almost all of the quarter, and the link to YouTube is here. 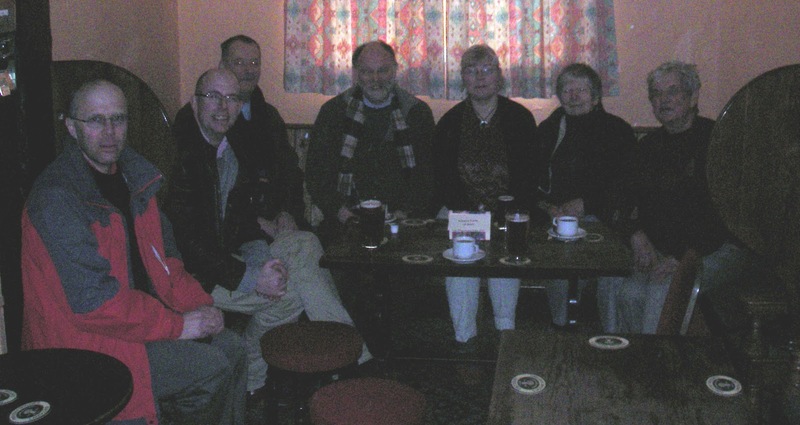 A quarter was rung at Longstanton on Jan 25th in memory of three ringers: Roger Bailey, Eddy Adams and Chris Beesley. 3rd Jan 2013: Andy Marshall, first surprise inside at Over. 30th Dec 2012: Jane Turner, first quarter peal at Swavesey. 27th Dec 2012: Members of the Society of Royal Cumberland Youths rang a peal of 5058 Bristol Surprise Major at Over. This was a first in method for Marion Robinson, rung to celebrate her birthday as well as Christmas, the Diamond Jubilee and the London Olympics. The photo shows Marion cutting her cake after the peal. 24th Dec 2012: Catherine Smith, first quarter in method: 1274 Plain Bob Triples at Burwell. 24th Dec 2012: Sheila Titmarsh, most quarters in a year and 20th quarter on Ely District bells in 2012: 1260 Plain Bob Minor at Rampton. 16th Dec 2012: Sean Edwards, first quarter away from cover; Nick Carver, first quarter as cover: 1260 Plain Bob Doubles at Isleham.